We all know the end-of-the-year holidays can leave one frazzled, but they can be outright brutal when dealing with deep grief at the same time. Many of us have become experts at putting the needs of others ahead of our own, allowing ourselves to suffer physically, emotionally and spiritually (with all kinds of excuses and ways of justifying it to ourselves). And we often pay a high price in the end. Let’s not do that to ourselves this year. Let’s do the smart thing for everyone around us, and “put the oxygen mask on ourselves first,” so that we are better equipped to do things for others. 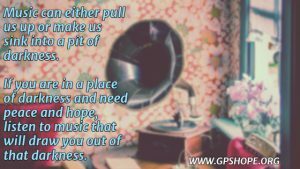 Music can either pull us up or make us sink into a pit of darkness. And if we are honest with ourselves, sometimes in our grief, we purposely choose dark music that will take us further down the path of depression. If you are weary and need some energy, put on music that will make your toes want to tap, even if just on the inside. Tip: When you don’t “feel” like it, is usually when you need to do it the most. So just go for it. What have you got to lose? If you are in a place of darkness and need peace and hope, I highly encourage you to listen to music that will draw you out of that darkness. It may be just instrumental music. It might be songs of hope, or songs about heaven. You know what kind of songs are the pathway to your soul, which will lift you up and give you the needed inner healing balm. When the house is either empty or quiet for the night, grab your favorite warm beverage, sit in a comfy chair and let the music just wash over your soul. Tip: I have a variety of play lists on YouTube, as the songs for that needed oomph or for calmness in my storm can change from day-to-day. I am not going to say too much about this, except to remind you that we don’t realize how dehydrated we get and how that wreaks havoc on our bodies and emotions. Just some of the symptoms are headaches, low energy, lack of focus, poor digestion, mood swings, muscle fatigue and dizziness (which is a symptom that has plagued me in the past until I started drinking more water). And this time of year, we tend to drink more of other beverages like eggnog, soda, wine, etc. causing us to drink even less water than normal. Tip: Fill up four water bottles first thing in the morning. Make sure you keep one with you at all times, sipping on it throughout the day. If you drink all four water bottles by the end of your day, you will find yourself starting to feel much better. 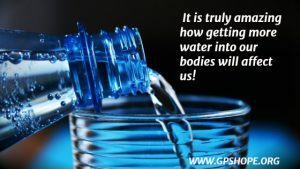 It is truly amazing how getting more water into our bodies will affect us! There are some things we think we “need” to do, that we really don’t. If you are continuing something because you are either being pressured or are concerned what other people will think if you don’t participate, that is the WRONG reason to keep going. I mean it! And that includes things like Sunday night or mid-week church services. Yes, I said it. If these things are draining you right now, and you dread going, don’t let people guilt you into it. If you are grieving, you are in recovery. And quite often, recovery means staying home and taking care of yourself. It’s okay and I give you full permission. Don’t continue doing things that take up time and energy that you just don’t have right now. 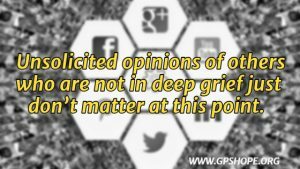 Tip: Realize that unsolicited opinions of others who are not in deep grief just don’t matter at this point. I don’t mean to an extra cookie or a glass of eggnog. I mean something that makes you feel pampered and relaxed, like going out for a massage or a pedicure, or going to a professional Christmas concert/show like The Nutcracker. Taking some time to treat ourselves triggers a message in our brains that we are valuable and allows us to enjoy ourselves, even if just for an hour or two. This self-care can go a long way in helping us through some of the darker moments of the season. Tip: If you don’t have the finances to treat yourself in this way, when someone asks what you want for Christmas, let them know how much you want an early gift of a massage or a pedicure to help you make through to December 25th. I know I have already shared four things, but please allow me to throw in one more, as an added bonus. Let me rephrase that: Soak in a hot bath with Epsom salts, burning aromatherapy candles and playing soft music. Much better! You may tell yourself that you just don’t have time to do something like that, or that it isn’t worth the time and energy to go to all that trouble. I know, because I have talked myself out of it way too many times. But this is truly something that can be pushed from the luxury column to the necessity column in your life. It affects so many areas when we are over-maxed and over-stressed. And what a way to end your day! Just thinking about it makes me feel more relaxed. Tip: Plan this a few days ahead, letting your family know. The anticipation will make it all the more wonderful when you climb in. 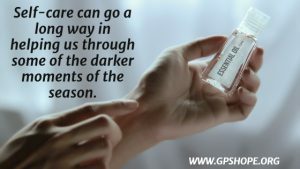 This time of year can be wonderful and magical, but for many, it is dreaded and draining, especially those who are in deep grief, like a parent who has lost a child. We just want to sleep through it all and wake up in January. I hope these suggestions will help you make it through with a bit more peace and give you a spark of light in your time of darkness. Yes, please send me Thirty Suggestions to Help Bring Ourselves Comfort and Take Care of Ourselves Body, Soul, and Spirit. If you are a bereaved parent and would like to connect with others in a meaningful way this Christmas season, join me live on Facebook each Sunday evening as we light a candle and I share a word of encouragement within the pain of not having our child during the holiday season. Just click here for more information. This blog is written by author and speaker Laura Diehl. Laura is a national keynote speaker and also a workshop speaker for both The Compassionate Friends and Bereaved Parents USA national conferences. Laura has also been a guest on Open to Hope several times, and has hosted her own conferences, a virtual conference and many webinars. If you would like more information about Laura as a speaker for your next event, click here.